Say, mister. 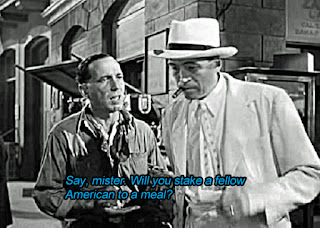 Will you stake a fellow American to a meal? Yes, it's very pretty. I heard a story once – as a matter of fact, I've heard a lot of stories in my time. They went along with the sound of a tinny piano playing in the parlor downstairs. “Mister, I met a man once when I was a kid,” it always began. Okay, to be honest, I’m not really sure how apropos these quotes are for the following piece. 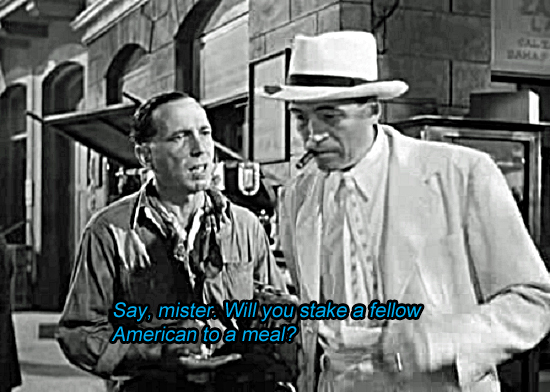 But hey, mister (and Ms.), why not look for an opportunity to get Bogart into a piece? I get the equivalent of “Hey, mister” sometimes when people that I know and sometimes people I don’t really know tell me they’ve got the greatest idea since the Moviola (remember those, Larry Maddox?) was invented. And if I write it for them we’ll both be rich. Or if I write it for them, they’ll take half of the gobs of profits and I can have the whole other half. So like Dobbs in Treasure of Sierra Madre, they want me to stake them to a completed script or manuscript from their original, fabulous, never-been-done-before, get rich quick, idea. I have a friend, let’s call him Friend, who is a non-stop idea machine. Not just for writing projects (both film and prose) but for pretty much every other thing under the sun. If he could just get one done he might actually make that million bucks. But he never does. He’s all talk and no sit-down-and-do-it. Re: writing he wants me to sit down and do it and split the billions we’ll make. He’s enthusiastic and the ideas fly out of him at a million miles an hour. Some ideas better than others, but nothing that makes me want to pull out a contract and say “Yeah, let’s do it.” He’s a fount of ideas, but I’ve been approached by others as well. They don’t seem to realize that I have ideas of my own. I’m approached fairly often with these fabulous offers, which I take about as seriously as the fabulous offers I see on late-night TV or hear from telemarketers. I try to help people whenever I can, as I’ve been helped by others. But one thing I don’t necessarily want to do is work on someone else’s idea at this point in my life. I’ve done that in the past. But that’s not where I’m at now. I don’t need the headaches of working with someone else, especially someone who wants it done their way but wants someone else to do it their way. And I have plenty of ideas of my own. Several hundred written down in a couple files on my computer. So when someone gives me the equivalent of “Hey, mister, can you stake a fellow American to a script or manuscript or whatever,” I try to politely turn them down. 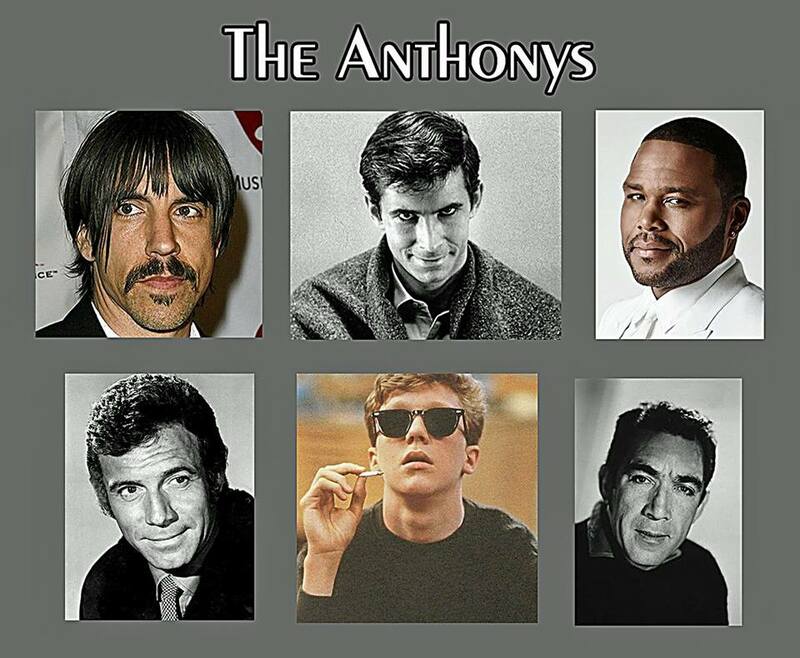 The Anthonys. Well, from the BSP Department and since Anthony voting is still in progress, I hope you'll consider voting for Broken Windows in the Best Paperback Original Department. Get that a lot, at reunions, funerals, coffee-with-my-old-buddies. "Say, man. I worked a case that would make a great book (or a great movie). You can write it and we'll split the money." I tell them – I don't need ideas, even great cases, I need time to write the ideas I already have in the filing cabinet next to my desk. I don't ghost-write either. Thanks for your comment, O'Neil. You mean you don't want to split the tons of money you'll get from your buddies' ideas? You could be living on Cloud 9 you know ;-) . But seriously, you're right, we need the time to write the ideas we already have. If I never came up with another idea I know I could keep working for 20 lifetimes. Writing is hard work, and it takes enthusiasm as much as anything else. It's hard to slave away on an idea that isn't part of you (Unless you've been paid to write the script or story, of course). I tell well-meaning but greedy people this. Never helps. 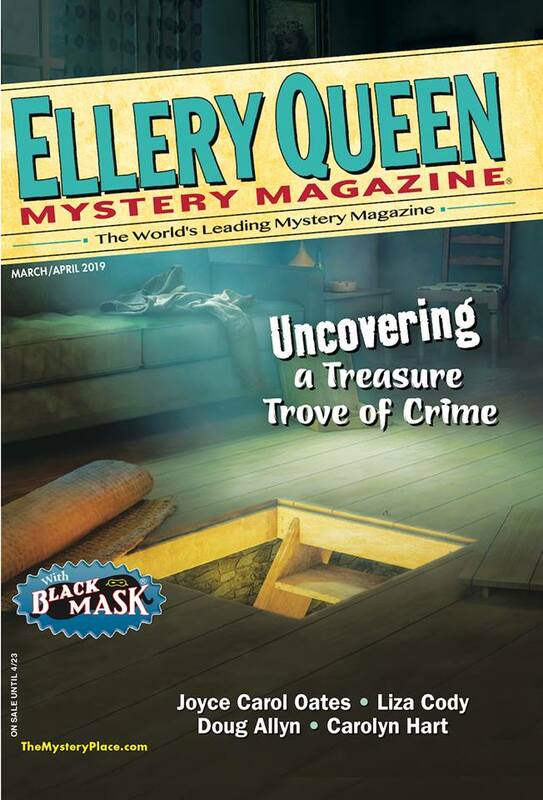 A few years ago, my wife's brother-in-law told me he had a great idea because "You're a crime writer so you know about this s#%&t already..."
He gave me an idea I'd seen or read dozens of times before. I told him to send me a ten-page outline with his major plot points and characters and I'd think about it. Fortunately, I only see him at one family holiday dinner, and I never remind him of our non-deal. I also hear this a lot. My response is: try writing it yourself. They usually protest, of course. However, I encourage them to try their hand at writing. Why not? I think that’s part of the problem, Steve. A lot of people don’t think that writing is hard work. And, as you say, it’s hard to work on something that isn’t part of you unless you’re getting paid, and even then… And you’re lucky you only see your wife’s brother-in-law once a year. Do any of them ever actually try writing it themselves, Jacqueline? That’s a good idea, but in my experience the number is 0. I, too have had a bunch of people at various times tell me they have a great idea for a story, and sometimes they proceed - over any attempt to cut them short - to tell me the idea. It is never unique. My favorite, though, was an in-law, who asked me what would be the best kind of story to write that would make him a millionaire? I thought about suggesting "Dianetics", but told him that if I knew that, I'd write it. Maybe. An ex-boyfriend had a fantastic idea for a mostly true story. I was thinking very seriously of writing it. Then two things happened: (1) I found out some of the stuff he had presented to me as facts, were lies; and (2) after several years of ill health, he passed away. I still have all the research I did for the story & maybe I'll eventually be able to make use of it. Met a guy at a gun store, the owner, who was a retired cop. He had notebooks full of bits and pieces of his career as an L.A. cop. He sort of wondered if it could be turned into a book or memoir. Maybe it could, but not by me. It didn't have enough meat on its bones though this was one good cop. I had told him that I was writing a series of stories about a guy who grew up with a father in the Mafia back east, but this guy got out, changed his name and became a private detective. My character's name was Johnny Casino. That's when the former cop told me his dad had been in the Greek Mafia. He told me a little about how that was for him growing up and even later. He remained a good cop even with a dad like that. That part became some of the feeling Johnny Casino had in my books. I gave him credit in the book for helping me find Johnny's soul. Nice piece, Paul. 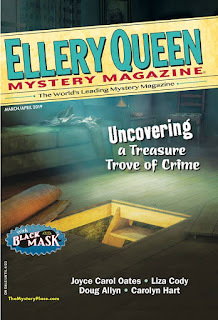 Only once have I run with someone else's great idea — and it really was a great idea: Last year, Sleuthsayer Michael Bracken invited me to submit to his The Eyes of Texas anthology, and I said I'd love to but had no ideas that could be Texased up enough to make them suitable. Michael asked me if I knew that there were German POW camps in Texas during the Second World War, at least one of which — Camp Hearne — is now a historical monument. I didn't know, and that one fact was all it took to get me writing. The result, "The Yellow Rose of Texas," will be in Michael's book, which is due to be published right around Bouchercon time. Thanks again for the great idea, Michael! A writer of my acquaintance bought my Hawaii-centric novel for information; said she was writing one set in Hawaii. Red flag! She then asked me to review a few of her chapters. As I was reading her MS, those flags turned glaringly Red. I offered her several cultural suggestions and spelling corrections, but my recommendation was that she take a very long trip to Maui and research her story first hand. I read a sample of the book on amazon and discovered she took none of my advice on spelling, names, or behaviors. I also noticed the book hadn't been reviewed. Fun piece, Paul! 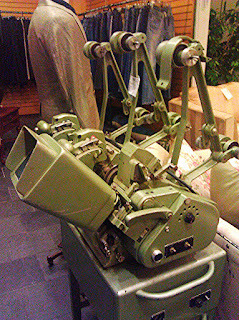 I do indeed remember Moviolas aka The Big Green Sewing Machines. You had to watch your fingers when using those suckers! I pay loving tribute to them in my story "Hot Moviola," published in the Gary Phillips edited anthology 44 Caliber Funk. I still crack up when I think how Larry David nailed the "Hey, Mister" moment on Seinfeld when he had George pitch a ludicrously bad LA Law episode to Corbin Bernsen. Thanks for your comment, Eve. Love your idea about telling your in-law Dianetics. Then he could start his own religion, too, and really get rich. Maybe write the story as fiction, Elizabeth. That way you’re covered both in terms of facts or not and also liability to a great extent. That’s a great story, Gayle. So sometimes I guess other people’s ideas do pay off. But probably not the majority of time. That’s a great story, Josh. And good luck with it in the anthology. I did a screenplay one time about a German POW camp here in California. It got a lot of attention but alas, as so often happens, didn’t end up getting produced. I still think about resurrecting it sometimes. Pamela, I think a lot of people are reluctant to take advice. They might figure that most people won’t notice but there’s always some that do. Nothing you can do about them, though. And, as you say, her book didn’t get any reviews. Love the title Hot Moviola, Larry. And much as I’ve watched Seinfeld, though it’s been a while, I don’t remember that episode. I’ll have to look for it. I tell people to purchase a spiral bound notebook, pencils and an eraser, and come back to me when they have the notebook filled with their great idea. No one has taken up my offer to help once they have the rough draft. Thanks for your comment, Catherine. And I love your idea. I might use it the next time someone hits me up :-) . Amongst SleuthSayers, I have the least experience, but even I've been approached about wring up someone's idea. Once a small town pitched its idea (seriously! ), wanting someone to write a biography of their hometown football hero… for a 10% share of the profits, which I'm sure would have come to tens of dollars. One project actually sounded a little interesting, the story of the first American Viet Nam War soldier, an actual decorated hero, who became the first deserter taken in by Sweden. Paul, from what I learned consulting for Disney, you have the right idea. If Disney realizes they're sent an over-the-transom story or script, they return it unread and preferably unopened. I ported my answer from the software industry: before looking at a story, I simply explain I need a non-disclosure agreement. Not one person has produced an NDA for me to sign. Whew. Leigh, I love the NDA idea. I might try that one, too. I also love the whole town wanting you to write their history for 10%. But 10% of nothing is nothing. If you were to do that or something like it you should get a flat fee up front. Hey, I've got this great idea for a panel at a convention! We all get together and tell our best "I-have-an-idea-you-should-write!" story! My favorite was a from someone I never met who was a friend-of-a-friend, who had this brilliant idea for a sci-fi novel about the Beatles in the year 3000 called "Beatles 3000." He was looking for a writer to do the novel because he figured he'd contributed enough coming up with the title and the concept that was going to make us millionaires (and thus able to afford lawyers when the Beatles sued us). Hey, Unknown (but I know who you are 'cause you told me ;-) ). That's a great idea for a panel. Then we can all make each other rich and famous and famous and rich. And I think your friend of a friend of a friend of a friend's friend definitely contributed enough just by coming up with the idea and title. Beatles 3000 -- how absolutely creative. Though I'd be willing to bet Paul, Ringo, Yoko and Olivia have already tradmarked that name.